The Scribble Scarf is an original design by Leslie Samson, which uses IAGARB Chunky Bunny Pencil Roving. This product is a versatile blend of 50% German Angora Wool and 50% Domestic Merino Wool. It has been prepared for you as an easy to use “tape” that has been rolled into a “cake” or “cheese”. Knitters, who enjoy creating pieces on large needles, can felt their work into fulled garments and accessories that are delightfully warm with a cushy texture. Our Pencil Roving can also be crocheted for the same effect as felted, knitted pieces. Our Pencil Roving makes an easy, pre-drafted single on which novelty yarns may be designed. It also makes luscious woven garments where our Pencil Roving is used as the weft. These directions are intended to a helpful guide to customers of IAGARB members who have purchased our 50/50 Pencil Roving. They will also refresh what people have learned in Scribble Scarf Workshops. The thickness of the plastic should be about 1 to 1.5 ml, similar to a leaf bag. 2. 1 Bamboo blind, hardware removed, at least the same size or larger than the plastic sheets. 5. Liquid soap. Soft Soap is a good choice. Place the bamboo mat on a work surface. Place one sheet of the plastic on top of it. Place the silk on top of the plastic. In a cereal sized bowl, mix soap with a little water. Because tap water varies in hardness, one recipe will not work for everyone. Too little soap will not sufficiently wet the wool. Too much soap will create too much lather. That will interfere with the felting process. If you are not sure, start with 1/3 cup liquid soap per 2 quarts of average hardness water. If you have softened water, add less. If your water is very hard – add more. You will want to work with wet pencil roving. The best way to do this, without tangling the roving, is to work with a little bit at a time. Loosely wind the pencil roving into a small, center pull ball around your hand. A ball that has been wound around your hand about 20 times is a good size. Keep it loose and relaxed. Place this ball into the bowl with the soap and water to wet it. 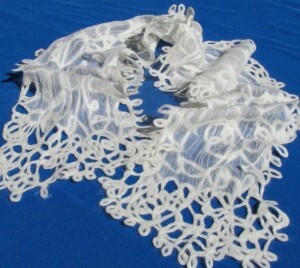 Gently pull the wet roving tape from the center of the ball and begin to “scribble” it directly onto your piece of silk. Wet wool will stay in place. Dry wool will not. Continue to scribble your design onto you silk until you have filled it as much as you like. When you are finished, dribble a little more soapy water on your silk and then place the second piece of plastic over the top of the silk. The next step is to massage the piece. By working your piece on top of the mat, you will gain extra agitation due to the texture of the mat. The top plastic will hold everything in place. If you wet the top of the plastic with a little bit of the soapy water, your hands will glide over the plastic. If you allow the plastic to become dry, your hands will stick to it and will cause your design to move and shift. You will want to massage the piece for 5 minutes. In this case “massage” means two hands, flat on the wet plastic, moving in circles. If you are too gentle – nothing will happen. If you are too vigorous, your design will shift. At the end of 5 minutes, your piece should look evenly wet between the layers of plastic. Some soap bubbles should be evident. Your design should not have shifted very much. Your top plastic will be flat and will not have shifted much either. Because your piece is protected inside two layers of plastic, it has extra strength. You now want to work the silk side of the piece. Without removing the plastic, carefully flip the piece over so that the silk side is now on the top and the pencil roving is underneath. The piece will remain protected with plastic on both sides. Massage your piece with the silk side up for 10 minutes. Remember to wet the surface of the plastic with soapy water. Next step – you have been working your piece as a single layer. As you massaged it, you stabilized your design and encouraged the wool to begin to move within the weave structure of the silk. Now, it is time to step up the process. 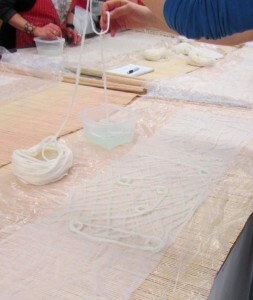 Gently roll the piece inside the bamboo mat. Start at one end and roll it. Do not try to roll it tightly. Wrap the bamboo roll inside an old bath towel. The towel will hold the roll together and will soak up any excess water. Gently roll the mat, which is inside the towel, back and forth for about 1 minute. Unroll everything. Smooth out your plastic. Reroll from the opposite end. Once again, wrap the roll in your towel and agitate it back and forth for another minute. Repeat this process 2 to 4 more times. If you are new to felting, more rolling will help to stabilize your piece before you move on to the next step. 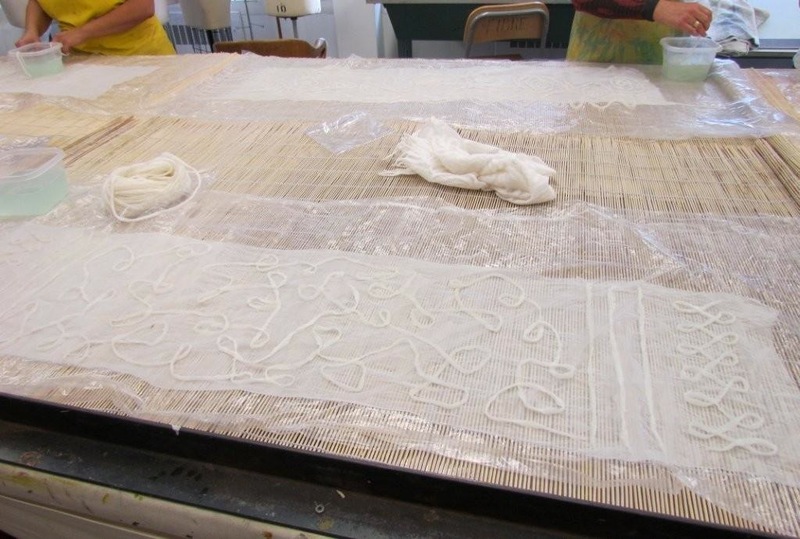 When your piece is in a roll, you will be working about 8 layers at a time, instead of just 1. The wool will travel into the weave of the silk. You can check this by squeezing out excess water and looking closely at the silk. Can you see fuzz on the silk side of your piece? If you can then you are ready for the next step. For the next step remove the plastic and roll your piece only in the matt 2 more times. FELT SHRINKS IN THE DIRECTION IN WHICH, IT IS AGITATED. So far, we have only been working the silk from end to end. This will shorten the final scarf. Now it is time to lose a little width. Fold the scarf into quarters from end to end. Turn the piece 180 degrees so that its width is now agitated. Roll in your bamboo matt 4 times. Between each roll, flatten out the piece, rub out any wrinkles, re-wet the felt if it looks dry or fuzzy and always re-fold in a different place than the last folds. The next step involves continued shrinkage of the width. You will not need your matt anymore. Fold the scarf, roll it on itself and wrap it in a smooth dishtowel. Roll it back and forth 4 more times. At this point, your scarf should be done. It must be rinsed to remove all of the soap. Gently rinse it under warm water. Squeeze out the soap but do not wring it. Finish the piece by blocking it with a hot iron.